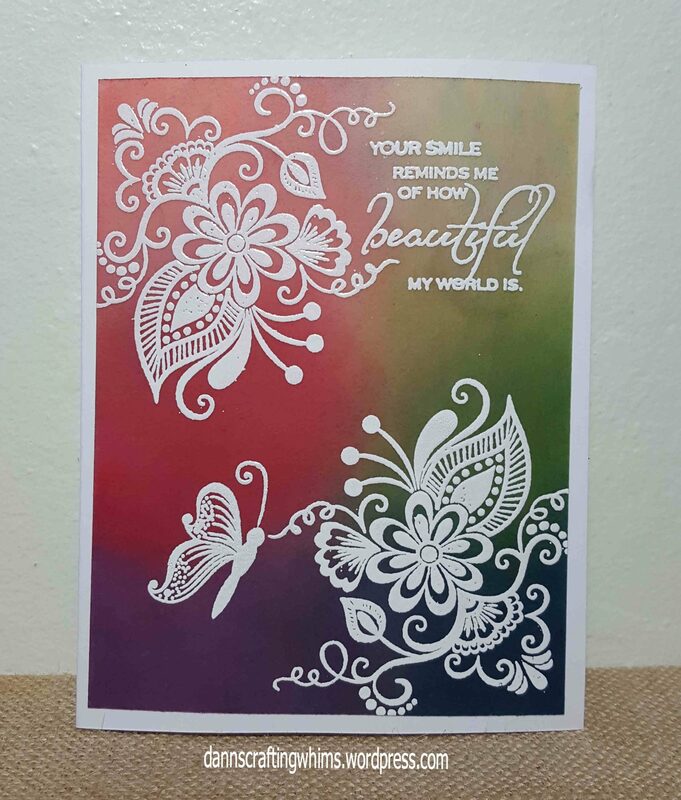 Of course, the beautiful images and script in the latest Stamp of Approval Beautiful World Collection by Catherine Pooler help add to the loveliness! If you didn’t get one, don’t worry, they’ll be out individually by each of the manufacturers in a few months. Since it produced such rich colors, I wanted to see what vellum-on-vellum would look like, so I die cut some heat embossed images on vellum and layered them on top for the second card. I even did a little it of dry embossing on some of the leaves. In my honest opinion, you get just as good a look with heat embossing and a lot less fuss! With all the heat embossing, the plain vellum butterfly looked too plain, so I stuck some Stickles on him and added a few pops of color to some of the flowers to finish it off. I hope to be back tomorrow to show you the two amazing acetate cards I’ve done and hopefully I’ll have time to do one more that I’ve been wanting to do for ages… Do come back to see! This entry was posted in Any Occasion Cards, Cards, Friendship Cards, Papercraft, Thank You Cards and tagged Coloring vellum, Gina K Beautiful World, OCCClearShear, Stamp of Approval Beautiful World Collection, stampofapproval, Sugar Pea Designs Enchanted Butterfly, Sugar Pea Designs Enchanted Garden, vellum by dannscraftingwhims. Bookmark the permalink. Great card. The technique does look really effective doesn’t it! (thud….) I am absolutely swooning over your cards, D. Ann!! I’m sorry I didn’t get back here for a couple of days. I am fighting one of those nasty spring colds and have been on the misery and woe list. Today, I finally am beginning to feel a little bit better. But I have had my emails with your lastest installments starred so i wouldn’t forget to come over and look. So glad to not miss these! My crafty pal, Karen, has been doing vellum tricks like coloring them with inks, too…which has had fabulous results. Now I see yours with that same awesome look and I wonder why I have never tried this beautiful technique. 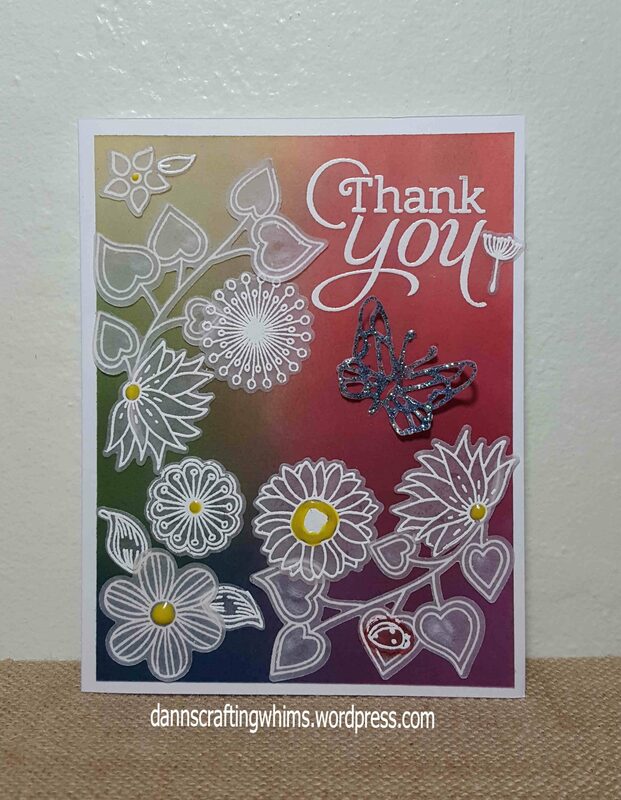 Your heat-embossing on the vellum is absolutely flawless……I am entirely impressed!!! Wow…I can’t choose which I like better with the images layered or just heat-embossed directly. Both so very lovely……but I think I like magical look of the layered ones a little better. Hard to choose, though. Thanks so much for sharing your cards from this class. I just love it all!! !